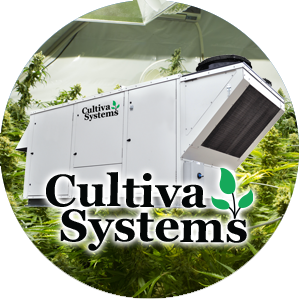 Traditional HVAC units can’t handle the challenges within a grow facility. Our products balance many factors, such as: temperature, humidity, air flow, air filtration and air cleaning. Keep Plants Warmer Than the Air - Virtually eliminating moisture forming on plants and potential for disease. Two major types of low-intensity infrared heaters are typically used in greenhouse applications: Unitary and Burners-in-Series. Unitary heaters have a single burner located at one end of the heat exchanger tube. The combustion takes place at the burner end, and the products of combustion are exhausted or vented at the opposite end. As a result, one end of the heat exchanger tube is warmer and gives off more heat than the other end. If the heater is mounted high enough, the end-to-end heat difference is minimized. Since most greenhouse buildings are relatively low (less than 20' [6 m] high), the difference in heat can be noticed from end to end. To minimize the uneven heat distribution, the heater can be installed in a U-shape. As a result of making a U-shape, the overall length of the heater is halved, reducing the area of heat coverage at the floor. The Burners-in-Series type of gas-fired, low-intensity infrared heaters is most suitable for greenhouse installations requiring even heating. Burners-in-Series heating systems have multiple burners along the length of a heat exchanger tube. The burners are incrementally spaced along the heat exchanger tube to allow the heat exchanger tube to be reheated before surface temperatures cool. This type of infrared heating system offers heat distribution far beyond the capabilities of unitary heaters or high-intensity heaters. 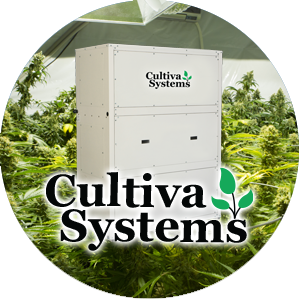 Overall heater lengths can be much longer and system shape is custom engineered to fit the greenhouse type. Multiple burners are vented through a single pump allowing fewer venting penetrations. Heaters with the trade name CORAYVAC® have a Burners-in-Series design. 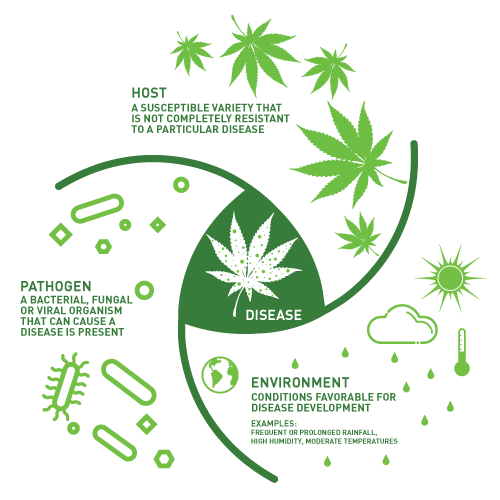 The three sides of the plant disease triangle represent the three components necessary for plant disease to occur. The three components are the host, the pathogen and the environment. The host is the plant or part of the plant. The pathogen is the biological infectious agent (i.g., virus, fungi, bacteria, plant parasitic nematodes, phytoplasmas). The environment creates a condition conducive to the spread and/or manifestation of the disease. Heating with a well-designed, installed low-intensity infrared system can, in many cases, help to interrupt disease-conducive environmental conditions, thus breaking the plant disease triangle. Two of the most common conditions that encourage many plant diseases are plant wetness/free moisture on plants and high humidity. These common greenhouse conditions are controlled very effectively with infrared heating. Since infrared heating keeps surface temperatures above air temperatures, surface moisture is evaporated more rapidly than is possible with conventional heating systems. 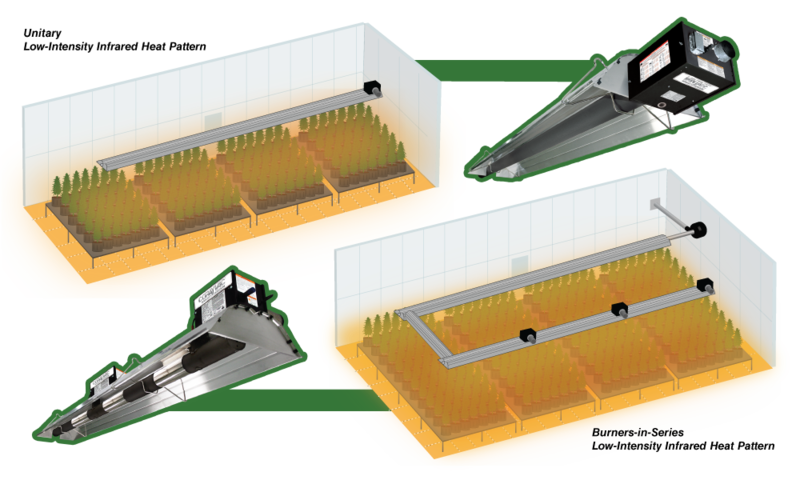 Low-intensity infrared heating therefore can help the grower to effectively control humidity– one of the key environmental factors leading to many diseases. This natural and beneficial "side effect" of elevated surface temperature happens with even-heating infrared systems and occurs without the grower applying any special techniques. 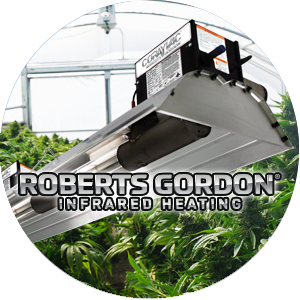 The ease of controlling free moisture on plants is a tremendous benefit of infrared heating. Root Rots — Pythium (Black Rot or Water Mold), Phytophthora (Crown Rots), Rhizoctonia, Sclerotinia Sclerotiorum (Cottony Rot). Periods of plant wetness, as well as wet potting medium allow a suitable environment for root rots. Infrared heating keeps the soil warm to help control periods of overly wet soil medium. Disease can also be spread by insects in wet environments. Certain insects thrive on algae growth on pots, soil, floors or benches in wet environments. These insects can deliver bacteria or fungus-causing diseases like Thielaviopsis root rot (black root rot). Since infrared heating quickly evaporates moisture on all of these surfaces, it can interrupt the wet environment and help to prevent the environmental conditions that attract insects. Insects that thrive on wet environments include fungus gnats and shore flies.